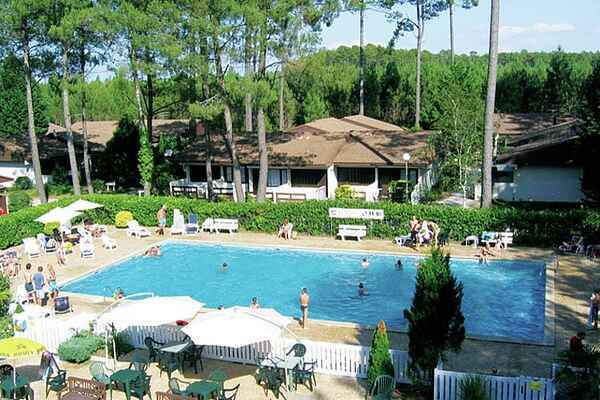 You stay in a two-room bungalow (31 sqm) on bungalow Club Atlantique, a car-free holiday in the Landes coast, about halfway between Bordeaux and Biarritz At the front and back there are patios with seating where you can enjoy the sun. The park has 240 bungalows, of which 100 are hired out as holiday homes. The bungalows are spread out over the entire area, connected by pathways and green areas, giving the kids plenty of room to play in. At the centre lies a large enclosed swimming pool surrounded by an inviting sun terrace with loungers, chairs and benches. A bar/restaurant with outdoor seating adjoins the pool. Various activities are organised in the park, such as sports tournaments, gymnastics, aqua jogging and bike tours. Plenty of fun for the children with games, a playback show and face-painting to participate in. There is also a jeu-de-boules pitch and a tennis court. The park borders on a wood where you can take wonderful hikes. Club Atlantique is situated on the 'Route des Lacs' in Lit-et-Mixe , home to a range of beautiful lakes. This include Uza at 5 km and the lake at Léon (20 km), with its nice playground and little beach.